This workout idea is from April Wright of April Wright PT. Thanks so much for sharing with us April. Set up cones for suicides. Have everyone start together using resistance bands to complete 10 reps of Exercise 1 and just 1 rep of Exercise 2, then 8 reps or Exericise 1 and 1 rep of exercise 2….2 reps of exercise 1 and 1 rep of exercise 2. When the first person has completed the ladder, they yell, “POWER!” and everyone stops where they are and does 10 reps of the POWER move. Then everyone starts again, but this time with 5 reps of exercise…1 rep.
Start again for 10 reps and then 5 reps repeating for 5 minutes. In between each ladder they will complete 5 minutes of a suicide run drill. Once 5 minutes is up, start a new 5 minutes running to cones and doing Broad Jumps on the way back. 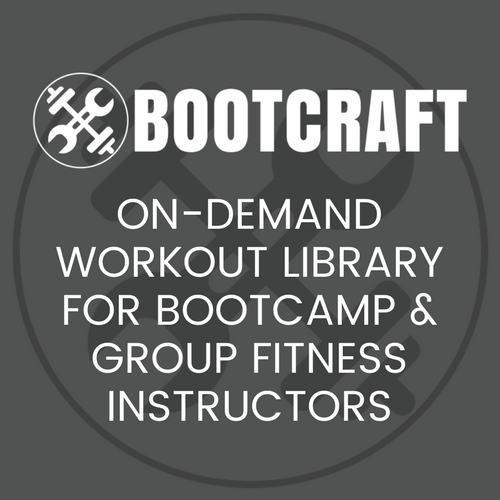 BootCraft is a workout idea database created by us, the Bootcamp Ideas crew, for you, group fitness trainers. It’s a fantastic tool to have in your toolkit and makes planning workouts each week so much easier and faster. Hiya, I really want to do this but I have no idea what a banded plank punch is? Hey Mandy, it’s like a Renegade Row, but instead of using weights wrap a band around your back (like you’re doing banded push ups).